2017 proved to be a tremendously strong year for INSIGHT. New challenges keep us growing and learning as we try to keep up with Idaho, the fastest growing state in the nation! It was our busiest year on record, and 2018 seems to be keeping pace. Thanks for moving here, California! We were sad to see Joe Bruce and Chris Dwyer move on to different architectural paths, but we welcome our newest addition, Jackie Salyer, who is ably tackling everything that we throw in her direction. Simplot, St. Luke’s, The Idaho Military Division, and the Roman Catholic Diocese of Idaho have continued to provide us with many rewarding projects, as well as countless others. This 14,000 square foot facility for the city of Boise will be Idaho’s First Commercial Net Zero Building, and will be LEED Certified Gold. The Smart 50 Energy Award recognizes municipal-scale projects that exemplify innovation and concrete influence in their community or communities or implementation. Finalists will receive honors at an awards gala to be held on March 26, 2018 in Kansas City, Missouri. “We were overwhelmed with strong submissions from over one dozen countries and covering solution areas from waste management to smart glass to safer streets,” said Smart Cities Connect managing editor Laura Benold. “We want to do something different with the Smart 50 Awards and to look at actual implementation as a key driving force behind recognition. Smart projects are happening all around us in ways that aren’t always apparent, and we want to shed light on those.” All of us at INSIGHT are humbled and thank Smart Cities Connect for this honor. The entire fifth floor of this building was renovated for this 16,400 square foot tenant improvement. Updated areas included reception, a break room, offices, a conference room, and restrooms. Striking colors and a fresh modern interior design update were provided by our in-house Interior Designer, Paula Dryden. Truckstop.com provides logistic solutions for freight management, including rates, negotiation tools, and route optimization. For this tenant improvement, INSIGHT remodeled approximately 15,500 square feet. Elements include new conference rooms, a reception area, offices, collaboration spaces, a breakroom, and cubicle work areas. Interior design was provided by our in-house designer, Paula Dryden. To continue its growth, Simplot Company asked INSIGHT to evaluate future greenhouse designs relating to air tightness, cost evaluations, and HVAC system recommendations. These green houses are currently planned as two new structures each year, with spaces to research potatoes, strawberries, and other crops. Continuing as a second phase to the earlier renovation two years ago, INSIGHT is remodeling additional Office Areas and filling in the existing mezzanine to create more office square footage. Elevator access is also added along with new interiors. Airy and open spaces, with clever use of daylighting and bright colors, make these areas inviting places to work. For this project, INSIGHT provided construction documents for an Ambulatory Surgery Center in Twin Falls, Idaho, based on the design development drawings provided by TENSCO, Inc. INSIGHT also assisted with the construction bidding process and performed brief construction observation services, as well as full Interior Design and Furniture Selection Services. For fourteen different parks in Meridian, Idaho, INSIGHT conducted individual surveys incorporating the four priorities outlined in Title III of the Americans with Disabilities Act (ADA). The priorities are accessible approach, access to services, access to public toilets, and access to amenities not required for basic access. Individual reports for each park were provided to the City for review. For the State of Idaho Division of Public Works, INSIGHT renovated the existing Sentry Canine Facilities, creating an improved living environment. Features include heating, cooling, insulation, ventilation, and improved floor drainage. The interior maintenance storage, washroom, toilet room, and canine food storage were reconfigured and replaced. Dog runs were added to the building exterior with provisions for proper maintenance. For these new parks in Meridian, Idaho, INSIGHT designed new restrooms and shade structures. Both are outfitted with water, power, and sewer systems. Features include parking and a site access drive aisle, picnic shelters, and lighting. These are welcome facilities in new subdivisions that include walking paths, tree-lined streets, and a swimming pool. 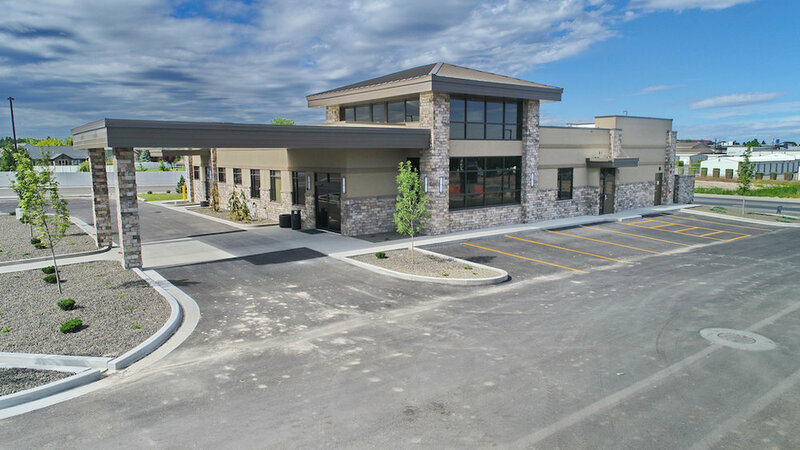 This project for St. Luke’s involves design and development of a new 5,800 square foot family practice clinic in Buhl, Idaho. This space needs analysis for Ada County will last through 2025 and will include data collection, a need and demand analysis, site and scenario planning review, master facilities plan recommendation, implementation guidance and other duties. INSIGHT has formed an excellent team with nbbj from Seattle for this project, and it has proven to be one of great collaboration. For this project, many different aspects of the St. Anthony Campus in Pocatello, ID will be either remodeled or built new. Elements include remodels to the sanctuary and office building, a new addition between the two, a remodel including new roofing for the gym, and a new parish ministry center, adoration chapel, courtyard, and patio. The scope is to renovate this 100-year plus Cathedral stairways to last at least 50 years or more, and to make them safer and more conducive to events, as well as blend the style with Cathedral Romanesque design. An ice melt system will be included, and the sizes and heights will be adjusted to make traversing the stairs easier. This project consists of designing a Climbing Wall facility in Meridian, Idaho. Phase I includes 3D Drawings, elevation concepts, a site plan, and project budgeting. Preliminary Phase II includes colored graphics as well as promotional materials. For seven different projects inside the Washington Group Plaza, INSIGHT will design and renovate tenant improvements for St. Luke’s, including interior finishes. INSIGHT continues to do excellent work with the Idaho Military Division. We are proud to be involved with six new projects, including a Troop Medical Clinic, a Cold Storage Building, a Class IX Warehouse, a General Instruction Warehouse, a Component Cleaning Facility, and a Reception, Staging, Onward Movement, and Integration Purposes (RSOI) Administrative Building. For everyone at INSIGHT, 2016 has been a great and productive year! We have completed many projects, and currently have an incredible workload that challenges each of us in a creative way. 208.338.9080 insight@insightarchitects.com Insight on Facebook 2018 INSIGHT architects, p.a.